Make a gift to Music on the Hill to support this program bringing free concerts to the Santa Fe community. Your support makes a difference! Come out and dine at these local restaurants who support Music on the Hill. Twenty percent of the evening’s food and beverage sales will benefit St. John’s College free summer concert series. A drop-off site is located at the entrance to campus on Camino Cruz Blanca for those unable to walk from the designated parking areas. Across the street from Santa Fe Prep with access from Camino Cruz Blanca. Parking is no longer available at Museum Hill. Instead, shuttle parking is available with the Santa Fe Pick-Up. 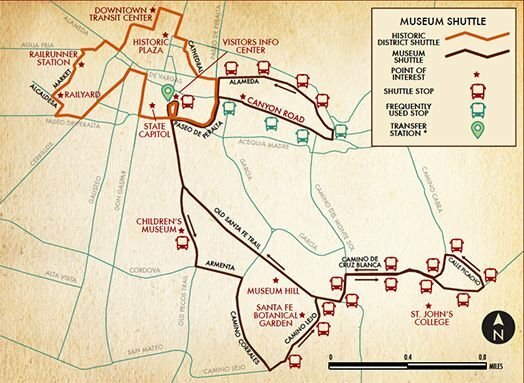 Park at the PERA lot transfer station and ride the FREE Santa Fe Pick-Up Museum Shuttle up to Music on the Hill. The Santa Fe Pick-Up hours will be extended until 8:30 p.m. for each concert evening. We thank the City of Santa Fe for extending their hours for the public to attend these free community concerts. For more information visit takethetrails.com or call 505-231-2573. Handicap parking is available for those with a handicap permit. Proceed to the main college entrance where security personnel will direct you to the appropriate lot. Concertgoers are advised to use the designated parking lots and heed all “no parking” signs on local area streets. View map of designated parking areas. Please do not park along any nearby streets, including Camino Cruz Blanca, Camino San Acacio, Calle Rumolo, Camino Cabra, or Camino Picacho. The areas will be monitored by the City of Santa Fe Police and will be subject to parking violations. Ask anyone to leave due to inappropriate behavior or conduct.